WHAT WE DO TO GRASS AND WHAT GRASS DOES TO US? The existence of humans and nature is usually seen as opposing binaries i.e. they are viewed as entities that exist separate from one another. The ways in which we interact with nature, the activities that we conduct, the things we produce are generally exploitative and harmful towards the natural world. Any form of connectedness or interrelationship across species we have is generally thought of as one of subjugation. This project is an attempt to change our relationship with nature and go beyond our ego as the ‘conqueror’ and the other as the ‘conquered’. It tries to see whether these other species have their own autonomy and agency. Are we making use of them or are they really also making use of us? Art making (human activity) is used as a strategy in this context to express an ontological continuity between society and nature - the humanisation of nature and the naturalisation of society. Therefore we walked through grass as a way of restoring balance. Changing the role of the human, working for nature (by unintentionally spreading seeds, furthering the reach of some grasses versus the others) instead of them working for us. 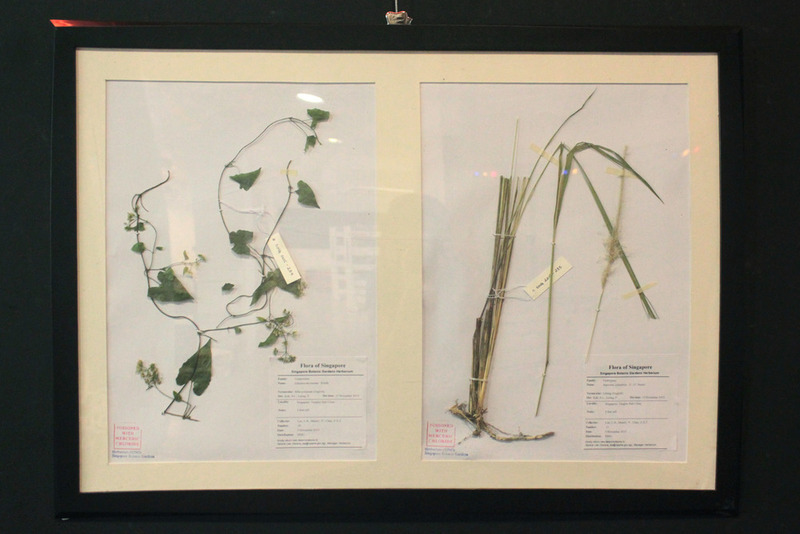 Collaborating with the Singapore Herbarium, this project identifies and exposes the silent war between migrant grasses in Singapore that use humans and human activities as a way of spreading their domain over the landscape. Exhibited at the ADM Library in NTU this project was documented in the form of a collection of scientific specimens of the grasses that we collected and identified from our walk. We also displayed a series of materials that caught grass seeds, the clothes that we wore during the walk and a video that documented the experience of walking through wild grass from the perspective of the grass! In line with the Indian cosmological worldview which expresses a different relationship between humans and nature, this project views humans and nature as two parts to a whole - as complements and not binaries. Read more about my reflections on the project here. Zachary Chan, Stanley Ho and Luo Ling Bo.